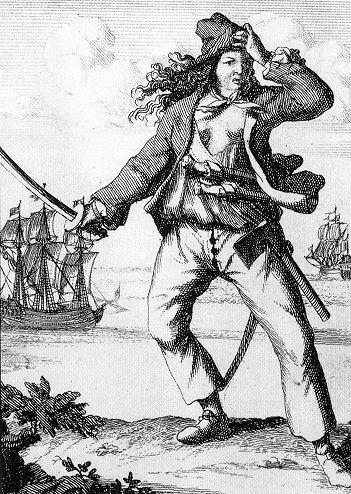 Anne Bonny was born on March 8, 1702. She was born in Ireland, but her family moved to the Americas soon after she was born. Her father became successful in the merchant business and she could have gotten a good marriage, though she chose to marry a poor sailor named James Bonny between the years 1714 and 1718. When her father disowned her, Anne and James moved to Nassau, in the Bahamas, where James worked for the governor. In the Bahamas, Anne met John Rackham, or Calico Jack. Anne and Jack became lovers, having a child named Cunningham together. Anne divorced her husband, left Cunningham, and ran off with Rackham to live a pirate's life. Mary Read was born in England in the late 1600s. She was the illegitimate daughter of the widow of a sea captain. To receive financial support from her paternal grandmother, Anne was dressed as a boy, pretending to be her older, legitimate brother. Read continued to dress as a boy to find work, becoming a footboy, and later, a soldier. Read, still in disguise, fought in the British military during the Nine Years War against the French. During the War, she fell in love with a Flemish soldier. The two got married and bought an inn in the Netherlands. When her husband died, Read again dressed as a man and wen on board a ship to the West Indies. Pirates captured her ship, though she took King's pardon in 1718 to become a privateer. In 1720, after she joined a mutiny with her crew, Mary Read joined Calico Jack Rackham and Anne Bonny on the pirate ship Revenge. 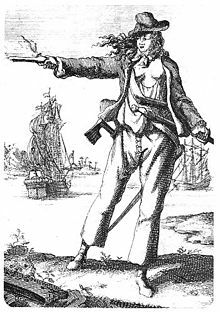 Because she was still dressed as a man, Anne Bonny began to take a liking towards Read, so Read revealed that she was a woman to both Rackham and Bonny. Rackham allowed Read to stay aboard as a woman, and both Bonny and Read were said to have been capable fighters in combat. Though they were women, both Bonny and Read made it on to The Boston News-Letters's Wanted Pirates list. In October of 1720, Jonathan Barnet, a privateer from Jamaica, attacked the Revenge. Most of the pirates aboard Rackham's ship were either drunk or asleep, though four pirates, including Rackham, Bonny, and Read, were able to hold off Barnet's men for some time. They were eventually captured and imprisoned. Rackham was executed, but both Read and Bonny had their executions postponed because both were pregnant. In 1721, Mary Read died of a fever in prison, supposedly during childbirth. Anne Bonny has no record of release or execution, because (most likely) her father smuggled her out to South Carolina, where she gave birth to Rackham's second child, remarried, and had ten more children. She died at the age of 80 on April 22, 1782. Bonny and Read are on this list because both were pirates (very good pirates), but both were women, breaking the usual stereotype. Both proved that women were as capable as men at privateering and pirating in a time when women were viewed as inferior.